Is/was there more than one “David Roberts” UK Diplomat? Apparently so! This could be our man! Well, if David Roberts really thought all that about us, he should have said so while he was here. Oh… he did, just not to our face – but authors Matthew Parris and Andrew Bryson recently obtained Roberts’ and other diplomatic reports under Freedom of Information and published them in a book called Parting Shots. The High Commissioner to Barbados, David Roberts, sketched a situation by no means unique. “It is now the exception rather than the rule for a young and outstanding Barbadian to be educated at Oxford or Cambridge. Thus, through death, retirement or more lucrative employment, the generation of men who read greats, economics or law in the U.K., acquired an affinity with our way of thinking and an acceptance of our social values, and came home to govern Barbados, will pass away. Okay, Mr. Roberts does have a point about turning out too many lousy lawyers and not enough skilled trades workers – but he sounds way too full of himself. His colonial nose is stuck so high in the air he wears loafers so he doesn’t have to look down to tie his shoes. Hmmm… I wonder if our wonderous reporters at The Nation will read Roberts’ entire report in the book and then ask Paul Brummell, the current High Commissioner, for comments? I had to smile when I saw the email advertisement for Piano is Life sent around by our friends at Carib E-Trader (caribetrader.net). How true that is, or could be – but it all depends upon the teacher. Parents can push all they want but if the teacher doesn’t love to teach and love young people, the kids sense that right away and it sets the stage for failure. Sorry to tell the truth, but too many musicians only “teach” to make money. It’s not what they are really about – they save their real love and energy for the weekend gigs. Maachelle Farley arrived home in Barbados with her music degree in hand and a burning desire to share her love and gift of piano with young people. Everyone knows that she has talent. Anyone who’s seen her play or sing at church or elsewhere can attest to that. But can she teach? And can she teach children? Last November Maachelle opened her Piano is Life studio and according to our friends more than a few parents have discovered that she is delivering on her promises. The children are learning to play, and more: they are enthusiastic about their lessons and about practicing. Maachelle is practically bubbly with enthusiasm and love of music and the kids catch that from her. For obvious reasons I can’t provide more details but I will tell you this… our friends say that going to Maachelle was “The best thing we’ve done…” for their child. They describe Maachelle as “half teacher, half coach”. They say they have seen a change in their child that goes way beyond playing piano. 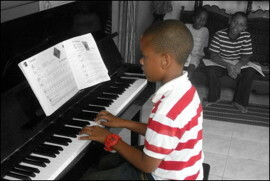 The child is more serious about everything and is focused on working hard to achieve goals of which music is just one. I wondered if that was just normal development that the parents are seeing, but our friends credit Maachelle Farley with a big part of the maturing they see with their child. Who am I to argue? So good luck to Maachelle as she continues to build her teaching career and reputation among parents. It’s also encouraging to see someone who could have made a good life for themselves in New York City or London decide to return home. Oops: Shona reminded me that Maachelle teaches adults too! Photo: From the last Piano is Life recital. Definitely NOT the child I’m talking about in our post. PhotoShop treatment by Shona.